Not even we can spend all of our time cleaning! Find out how the Spontex team get active within the community. GO THE OARS OF SPONTEX! It was once again time to dust off the paddles, don the life preservers and venture back out onto the Severn... training for the 2018 Worcester Dragon Boat Festival was upon us! In what is now an annual pilgrimage for the overly keen Spontex Dragon Boat Crew we spent 3 evenings at Worcester Dragon Boat Racing Club refining our technique, practising synchronised paddling and following the directions, advice and occasionally orders from the helm. We paddled together and with every the beat of the drum the boat went faster and faster, we felt exhilarated and confident... were we in with a chance this year?! We only went and won a trophy! Okay, so it's not the cup, but after the preliminary heats we found ourselves in the top tier which meant we had qualified to race for the cup! Despite competing against the biggest ever field, a total of 36 teams from in and around Worcester, we managed to finish in our best ever position of 11th overall and 4th in the mixed team group table. We were brimming with pride as we returned to Spontex HQ clutching our shiny new silverware! Winning a trophy aside, we're also very proud to have contributed towards the £1,700 raised by Worcester Dragon Boat Racing Club for Worcester Snoezelen, an independent charity specifically set up to offer multi-sensory and creative activities for people who have a diverse range of disabilities. THE ZULUS KICK-OFF IN DEVON! Here at Spontex HQ we love sport and we love Worcester, it’s been our home for the past 19 years, so we couldn’t have been happier when we were asked to sponsor a group of local lads for their upcoming rugby tour. These formidable young men are members of the Worcester Rugby Club Under 15s Team called The Zulus… and they really are fiercely competitive warriors!!! A touring party of 70 people, 25 Zulus supported by a very dedicated bunch of 45 parents, took to the road at Easter to tour North Devon. They played all of the tournament games at Barnstaple RFC and won them all, yes every single one! Well done boys, you’ve done us and yourselves proud! Spontex sponsorship along with other local companies paid for the shirts and we have to say the lads looked really smart, we particularly like the ties! We can't wait to see how The Zulus get on next season, keep up the good work! Spontex Take To The Water…Part 2! After a successful (ish) debut on the water back in 2015, The Oars of Spontex took to the river Severn once again to compete for the title of Worcestershire’s best Dragon Boaters! Unfortunately it never quite worked out that way, but we gave it a blooming good go - and had some real fun in the process! After 3 training sessions where we made the transition from beginner to novice (you’ll notice that indicates very little progress was actually made), team Spontex, sporting rather fetching red Baywatch t-shirts, splashed our way to the start line of the 2017 Race the Dragon charity regatta, with nothing but silverware in mind. The reality was that once again in our opening race we finished a convincing second (out of two). But not to be deterred, after a further two races we managed to paddle up the leader board and against all odds, qualified for the winners’ cup! Our tale of sporting immortality ends there though as more seasoned rowers were able to out-muscle us, but a final finish of 13th out of 24 and time well spent in the sun cheering on the other races rendered the day a huge success! More importantly, the Worcester Dragon Boat Racing Club donated all proceedings to Leukaemia Care charity, raising what they think will be a grand total of around £2,500. Although we’re now back in more familiar surroundings ensuring the world does not go sponge-less (no need to thank us, honestly…) attention has already turned to next year. A few of the crew plan to become fully fledged members of the Worcester Dragons so here’s to 2018…it could be our year! HEDGEHOG FILMS CLEAN UP AT THE OSCARS! Here at Spontex we love all things hedgehog and so not surprisingly we were absolutely delighted when we were approached by the Chair of the Hedgehog Festival in Ross-on-Wye and asked to supply the prizes for the much anticipated Oscars Night at Walford Primary School on the 17th March. The school hosts an annual awards ceremony where the children receive prizes for the best documentary film, the best sound track etc. This year, was the first ever year for the Golden Hedgehog Award! 29 children from Year 3 (aged 7 and 8) produced wonderful educational 3 minute films on how to care for hedgehogs. All of the children did such a fantastic job that it was difficult to choose the winners, they are all stars in our eyes! 5 winners each received a giant cuddly Spontex hog and all of the runners up also got their own mini cuddly hog. Since 2014, the Hedgehog Festival in Ross-on-Wye has gone from strength to strength. They now have at least one event per month to celebrate the hedgehog! Why? The Hedgehog is an ancient symbol of Ross-on-Wye, which goes back to 450 AD. To find out more about what they have planned, visit http://www.playross.com/hedgehog-festival. The Spontex team can’t wait for Mrs Tiggy-Winkle's Street Tea Party on Sunday 31st July. See you there! Make way for the Oars of Spontex! Meet one of the newest members of the Spontex family, Connor. Connor is the son of our Quality and Supply Chain Manger, Mel and we think he’s an absolute smasher. Unfortunately Connor hasn’t had the easiest start in life as he was born with Hypo Plastic Left Heart Syndrome. Thankfully because of the incredible work of Birmingham Children’s Hospital he’s now doing well and has a bright future ahead! To say thank you and support them in helping other children we all agreed it was time for us to do something a little bit different to fundraise for them! At Spontex we try to do as much as we can to support the charitable efforts of others. This is why, for the last 3 years, we have been proud to support Essex based charity, Wipe Away Those Tears. The charity was set up in 2006 by Gail O’Shea who, acknowledging how fortunate she was to have a healthy family of four, decided to help those less fortunate by raising money to grant wishes for terminally or seriously ill children in her area. Gail has since worked tirelessly to fundraise for the charity, raising £1.2 million over the last 9 years and has recently been voted Tesco Compassionate Mum of the Year 2015. Each summer Wipe Away Those Tears raise a phenomenal amount of money by holding a Summer Ball at which they try to give every guest a special goody bag. Spontex is proud to support the charity by providing products to go in these bags and has this year donated a Spontex Microfibre Kitchen Cloth and a Spontex Microfibre Window Cloth for each of the 170 guests. We’re sure the event will be the stunning success it always is and that everyone attending will have a wonderful time! Could you make room in your garden for a hedgehog? That was the question being posed by our friends at the British Hedgehog Preservation Society during this year’s Hedgehog Awareness Week (3rd to 9th May). Every year the BHPS arrange a week of events, competitions and media appearances to help raise awareness of the struggles faced by British hedgehogs and give advice on how we can help. It’s more important than ever before for us all to do our bit to help as hedgehog populations have declined by a third over the last ten years! Did you know that a hedgehog can roam a whole mile in a night to find enough food to survive? This is made much trickier by our garden fences and walls which carve up hedgehog territory and force them to travel even further to find the resources they need! The good news is that helping your local hedgehog population is really simple, all you need to do is make a 5 inch square gap in the boundary to your garden! You can do this either by making a small hole in your fence or digging a little channel underneath. Fair Play St. Johns Colts! 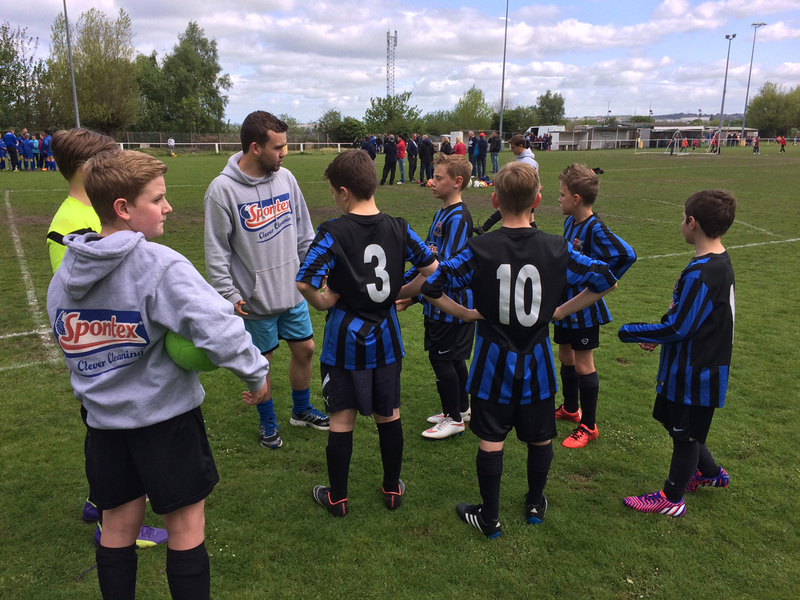 As the football season comes to an end we have to say that we couldn’t be prouder of the local youth team we sponsor, St Johns Colts United U12. Competing in their first summer tournament of the year, The Colts were proud recipients of the Max Edwards Memorial Fair Play Award. The award, scored by the tournament referees, is based on players, coaches and supporters attitudes towards each other, opponents and officials and helps to promote the values of the FA's Respect Campaign. It is testament to the great attitude and positivity shown by the young team throughout the season. Well done St Johns Colts, you’ve done us and yourselves proud! Meet St. Johns Colts United! Here in Worcester, the home of Spontex HQ, you'll find this dedicated group of under 12s training hard every Friday night. They're a great bunch of chaps committed to the game and each other and with the help of their wonderful manager Luke we expect them to go far! We've been delighted to sponsor the boys this season by buying their kit and we’ve also given them some cosy training hoodies. We think they look rather dashing, don't you agree? The team plays home and away matches around Worcestershire each Sunday and finished 2014 on a high with a nail biting 3 to 2 win! We can't wait to see how they get on during the rest of the season, keep up the good work Colts, you're doing us proud! When we heard about the brilliant work of local charity Worcester Animal Rescue Shelter (WARS) we decided we had to do something special to support them! WARS is home to over 40 cats and dogs who are cared for by a dedicated team of staff and volunteers until loving homes can be found for them. In fact the staff are so devoted to keeping the kennels and cattery in pristine condition that their own quarters have been a little neglected! In October Spontex changed all that by sending in a clean team to give the reception, kitchen, office and bathroom the deep clean of a lifetime. We won’t lie, it was a pretty tough challenge which took 2 days to complete, but what a difference! We also gave WARS a bumper package of products to ensure that keeping things clean will be better, quicker and easier! After the cleaning was done some of the team from Spontex HQ also decided to go the extra mile by volunteering their time to walking and playing with the dogs. We met lots of cheeky chappies, including gentle giant Flynn who enjoyed a good run around in the play pen, Monty who stole our hearts and the mighty Tommy, who took our smallest team member Jess for a walk, instead of the other way round! We were also joined by our friend Aggie MacKenzie who was on hand to meet staff and volunteers and celebrate the unveiling of the newly cleaned staff areas! Earlier this year we invited local people to nominate a charitable community space that deserved some help from Spontex! After reading through many applications, finding out about lots of fantastic community projects and lots of deliberation we finally selected a very deserving winner, the Worcestershire Animal Rescue Shelter. W.A.R.S have been providing shelter to neglected, abandoned or stray animals since they first opened their doors in 2001. Through the fantastic fundraising efforts of their staff and volunteers they have been able to purpose build a large kennel and cattery, an outdoor playpen and isolation block for those animals who need a bit of extra special care. The staff and volunteers at W.A.R.S are dedicating to ensuring that the animals in their care have the best time possible until loving new families can be found for them and ensure each animal receives some special attention every day. Unfortunately because everyone is so focused on the happiness of the animals they’ve forgotten to take care of themselves! The staff spaces have become a bit worn and grubby over time, but now Spontex are here to help! On October 31st the Spontex Clean team will be visiting W.A.R.S to help them get their staff areas back to their sparkling best! The Reception, Office, Kitchen and Bathroom will all receive a much needed a dose of clever cleaning and we’ll also be donating lots of products to help the staff look after the centre in the year to come! The Spontex Team are also looking forward to spending some time with the cats and dogs of W.A.R.S, giving them the fuss they so richly deserve! Our partner in grime, Aggie MacKenzie will also be joining us to cut the ribbon on the newly gleaming staff block! We’re delighted to be able to help such a worthy charity, and we can’t wait to show you the results! For more information about Worcestershire Animal Rescue Shelter and their fantastic work you can visit them at www.wars.org.uk. Here at Spontex we’ve always been proud to say that we’re the home of Clever Cleaning. Now we’ve decided it’s time to use our knowledge and resources to give something back to our home town! Spontex Head Quarters has been based in Worcestershire since 1999 and our brilliant staff come from towns and cities across the county. Recently we put our heads together to decide how we could invest something into our local community. After much discussion we realised we should do what we know best, CLEAN! We want you to nominate a local indoor community space that is in need of a Spontex clean! It could be a village hall, nursery, function room or kitchen, any space which is valuable to the local community and needs a spruce up! The winning venue will be visited by a team of cleaners and be brought back to life using Spontex cleaning products. It will also receive a prize package including gloves, cloths, scourers and mops to help it stay beautiful for the year to come! •	Where your community space is. •	What it does and who it supports. Photographs are very welcome but not essential! Closing date is September 19th 2014 and the clean will take place at a date to be arranged during October 2014.